Yandeyarra was the third stop for Marnti warajanga’s tour of the Pilbara. 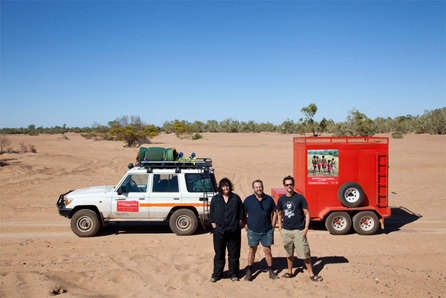 After visiting South Hedland and Warralong, the exhibition team drove south, arriving in Yandeyarra on 21 May 2012. 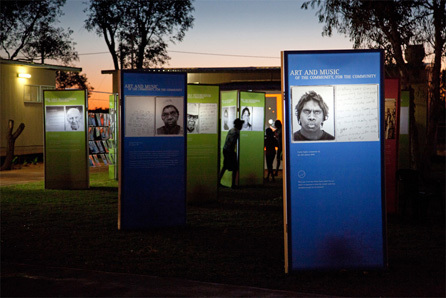 The exhibition was set up in the grounds of Yandeyarra Remote Community School. Over four days the team met and worked with the students and teachers at the school, displaying the exhibition and running photography workshops. Community members shared their proud history by taking the exhibition team on an excursion to the Out Camp known locally as ‘Frisco’ to see the remnants of the camp where many lived in bough shelters during the years following the 1946 pastoral workers strike. A community celebration was also held at the school to welcome the exhibition on the evening of 23 May 2012. The celebration was attended by popular actor, writer and the museum’s Advisory Council Chairperson William McInnes. The women of Yandeyarra cooked damper down by the river, and served it with kangaroo tails at the BBQ. After the speeches and meal everyone enjoyed live music by Pilbara band The Bad Influence.